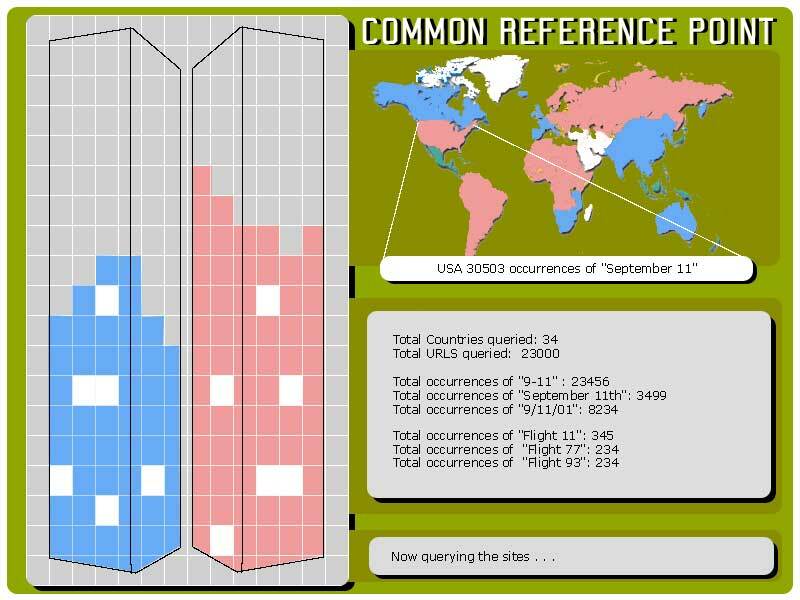 COMMON REFERENCE POINT – 2002 | JONAH BRUCKER-COHEN, PH.D. COMMON REFERENCE POINT – 2002 – JONAH BRUCKER-COHEN, PH.D.
International media visualization of the events of September 11, 2001. 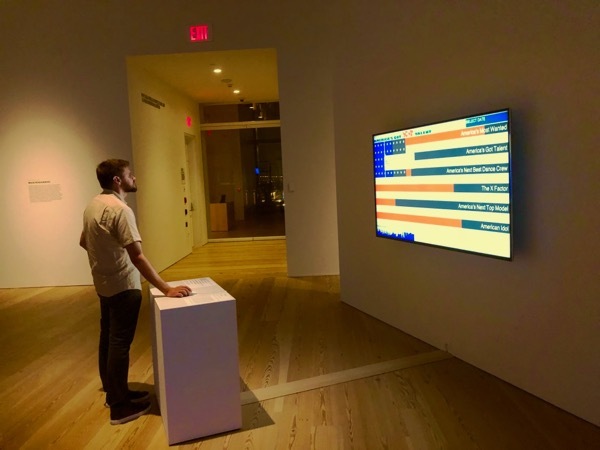 Common Reference Point is an interface that shows a daily depiction of the Internet and Mass Media’s perception of the events of September 11, 2001. The project consists of a data-mining spider that scours the Net looking for any mention of content specifically relating to September 11th. For instance the spider might look for possible combinations of the September 11th date or the various flight numbers of the planes that crashed. As the spider finds these references the system builds a model of the twin towers depending on the rate of incoming data. The CRP system also searches for any indication of the geographical region and location of the incoming data about Sept.11th. For instance, if the spider sees a “co.uk” on a URL it will add this entry to the collection of UK data. A world map on the screen will allow users to rollover each country and see what percentage of the data coming from that country is contributing to the formulation of the towers. In addition the text of the spidered articles will be available for the visitor to scroll through to see the context dates referenced in each of the articles. This data is an integral part of the piece because the texts form the backbone of the collected information and their collective force adds to ours and the world’s recollection and opinions about the events of 9/11. 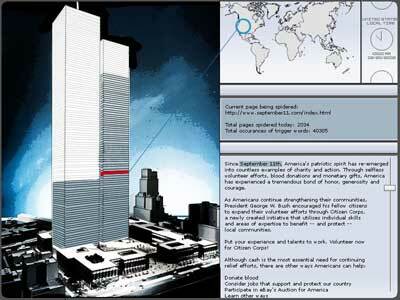 The system is also realized over time as more mentions of Sept. 11th make the towers grow larger and less mentions make them shrink in size and fade away. This allows visitors to not only have a visual representation of how often this information is being created and referenced, but also from where in the world the information is originating. Over time new and repeat users will revisit the project to see how this important event is being referenced worldwide.